I first came about this book when I was putting together a book list for National Autism Awareness day while writing a post for our library blog (I know, would you believe it, I contribute to 3 different blogs?) I was immediately anxious to read it, but I put it off because my current WIP has a supporting character who has an autism-like condition, so I didn’t want to read any other conceptions until he was fully formed in my mind (luckily I have a live in autism expert in the form of Mister BS, who put me in touch with a lot of great resources and was able to introduce me to children on the autism spectrum). Oh, was this book worth the wait. I fell in love immediately and devoured it in one sitting. The characterization of Marcelo is realistic and life-like. I felt like I knew him from the first page. The opening scene when he is meeting with researchers who are scanning his brain while he listens to “real” music versus his “internal music” was fascinating. Then, we are immediately thrust into the conflict of the story. Marcelo’s father is insisting he give up his beloved position caring for the ponies at his private school for children with exceptionalities to join the “real world” as a mail clerk in his father’s law firm. The plot unfolds with very careful development. I only question the reality of two minor elements—that Jasmine, the supervisor of the mail room—has been given a bonus of $2000 a month for accepting Marcelo as an assistant rather than her first choice. I think it’s more likely that a mail room clerk could earn a raise of $200 a month and consider herself lucky. I’m not sure a mail clerk at a Boston law firm would make much more than $2000 a month to begin with. I also found it unbelievable that Marcelo sleeps in a treehouse—year round? In Boston? That can’t be comfortable on the extreme ends of the weather spectrum, even if it is outfitted with electricity. Besides these minor snags, I was completely engrossed in the story. 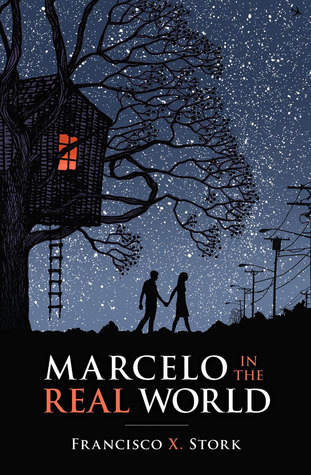 Marcelo learns a lot about the “real world”, including the lesson that is sometimes the most difficult for a son to learn—that his father is not perfect or infallible. I was particularly interested in the conversations that Marcelo has with his Rabbi friend. Though he’s Catholic, his primary interest is religion and God, in all forms, so he meets regularly with a friend of his mother’s, who he seems to speak the most freely with and who is able to candidly answer many of his questions about life. These scenes were particularly endearing. This was a feel-good book, a coming-of-age story in all the right ways, a story of family and friendship and finding your own way in the world. I recommend it for both teens and adults and this will be making it’s way onto my “favorites” shelf. Previous: Previous post: So you loved The Hunger Games…what should you read next? Great review. I’ve had this book for months now (maybe a year), but I haven’t read it yet. I might dust it off and open it up sooner rather than later. Thanks for the nudge.